In this article I will teach Mathcad Step by Step Tutorials for Beginners. Advance topic will be discussed in another article. There are two parts on this article. The first part is about software familiarization while the second part is about Mathcad computations. 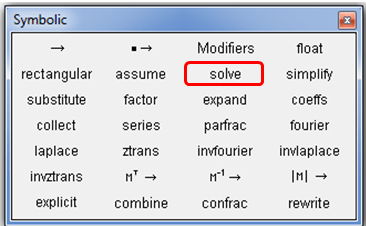 Open Mathcad software. 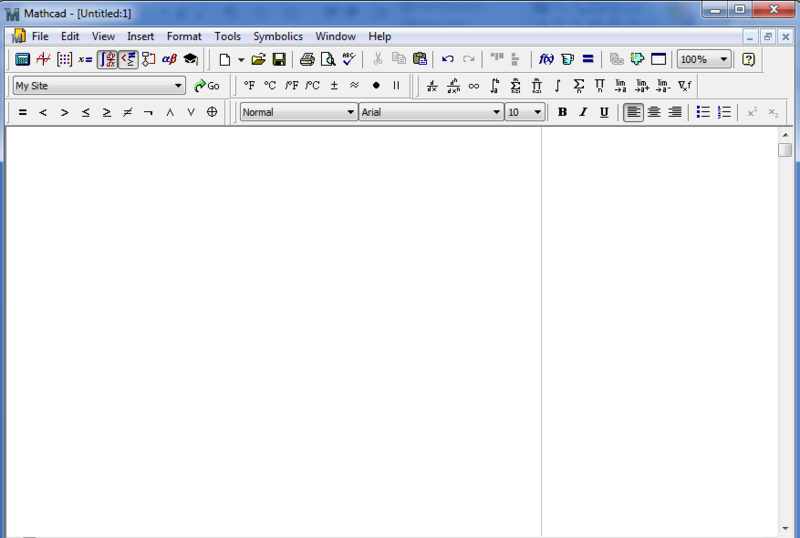 A blank page will show as Figure 1. We will get to know the menus. 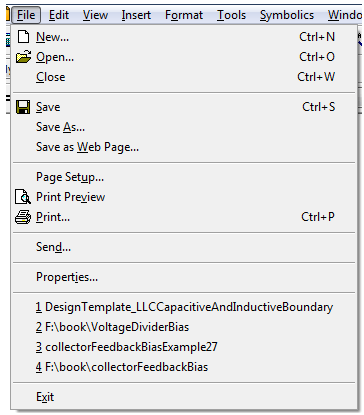 Page Setup – you can change the worksheet size here and so on. See Figure 4. 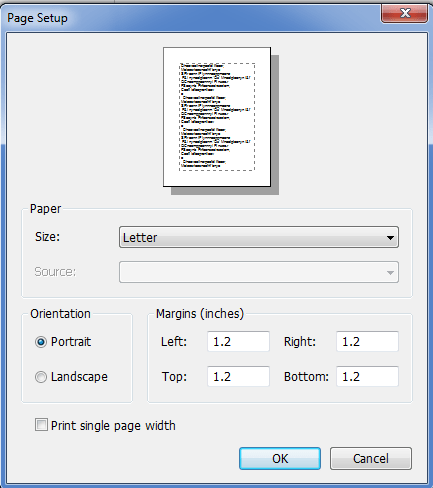 Print Preview – previewing the worksheet before printing. 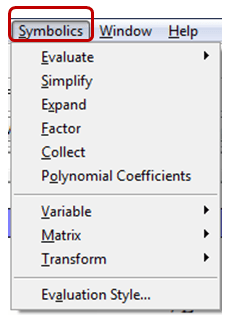 In MathCAD 14, this feature is not working well. Every time you preview the page it will result to error (you can try it anyway). Properties – just a file property. You may not alter this. 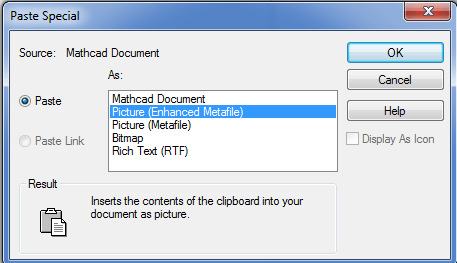 Paste Special – pasting a particular item with a specific file format. See Figure 6. Delete – delete a word, equation, image, etc. To delete, highlight the subject for delete then press delete. 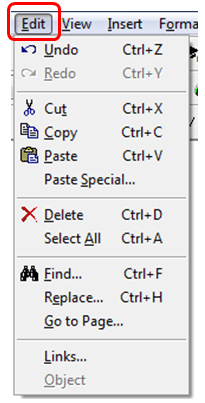 You can use CTRL+D. Replace – a certain variable. In Figure 7, enter the variable to be replaced in “Find what” and then enter the new variable to replace in “Replace with”. When you enter the variable that you want to replace and then click “Find Next”, it will highlight one by one the variable name it finds in the worksheet. If you only want to replace a single or a specific variable, just click replace once the desired variable is highlighted. On the other hand, if you click “Replace all”, it will replace all the variable name it finds matched with the entered variable. 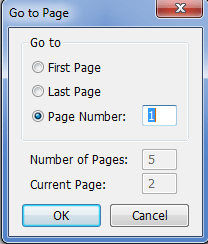 Go to Page – With this, you can jump to any page number you wanna go. Toolbars – You can hide or unhide toolbars here by checking or unchecking the boz on the left. We will only discuss the basic items in the insert menu anyway, once you always use MathCAD you will get familiar to all these. Page Break – Mark the end of every page. This is important especially when you print your worksheet. 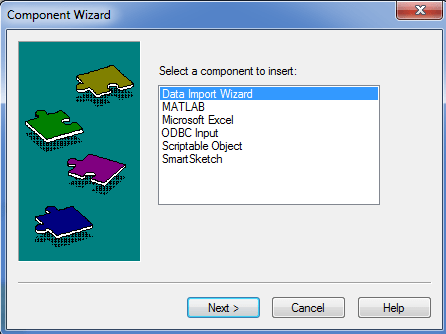 Data – also and advance tool, same with the Component, you can use MATLAB data, database, excel, etc. Control – also an advance tool, you can insert push buttons, radio button, text box, etc. This is more on beautification of your worksheet. You can change the color, settings of your graphs, styles, etc. 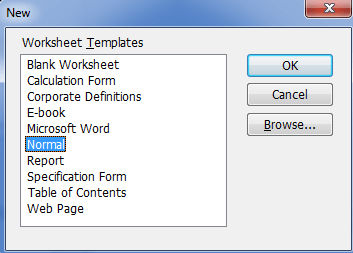 In here you can you can check the spelling if you want or protect your worksheet or compare worksheets. You can also borrow or returm license here. Under the calculate button, it is important to check the “Automatic Calculation” to automatically compute your worksheet. Under “Worksheet Options” you can specify the unit system yu want to use, you can change the display, dimensions, calculation, etc. You may not alter these. Under “Symbolics” you can simplify equations automatically instead of doing it conventionally (long hand method). We will have example on this later (below parts). 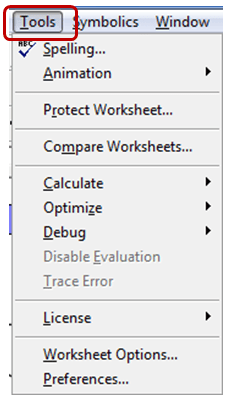 If you have many worksheets open, all these will show in this menu. You can select anytime to what worksheet to be activated. The documentation of the software. 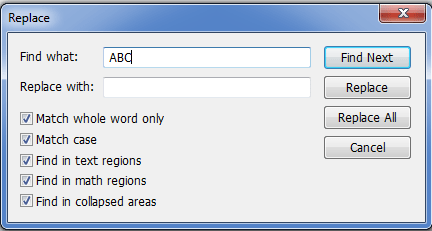 Step 1: Click on “File” then “New” and select “Normal” on the window below. You can also choose a blank worksheet if you want. After doing step 1, a new blank sheet will show. MathCAD always do computations based from the data above a particular expression of equation. For example, if you define an expression Area = L*W, the value of L and W must be declared above the equation, otherwise will result to error. Length = 10meters and Width = 10meters also. Just click the keyboard equal symbol to put the equal sign in the equation. To select meter, you can go to “Insert”à “Unit” then a window will popup. 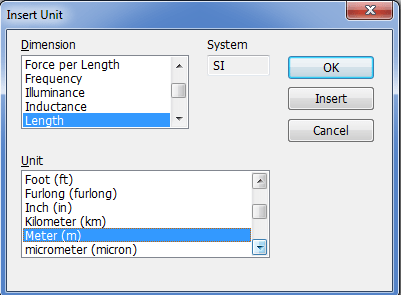 Under the Dimension, select Length and then select meters under the Unit section. 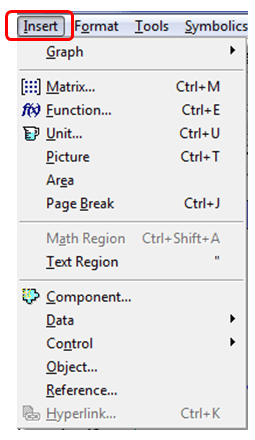 Another way of inserting unit is using the cup like icon in the toolbar section as Figure 18 shown. In either method you have to take note that after typing the number 10, do not put any space because a space will tell MathCAD that you want to input a plain text and not a variable. 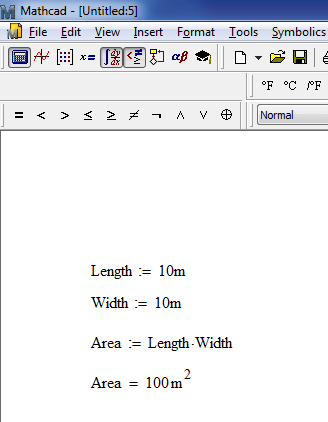 After defining the variables, you can now formulate the equation of Area which equals Length*Width in this tutorial. So, you must get below result. To modify the font of a variable, click to any variable and then start customizing through the menus highlighted in Figure 20. You can do the same process if you want to modify the constants. Note: Variables are the one handling constants. Length is the variable while 10m is the constant. To enter a text in your worksheet, type the text you want in the location you desired the text to appear then press keyboard space bar. Any space will make the MathCAD engine to disable calculation. In step 2, we learned the basic computations in MathCAD. Here we are going to use the symbolic tools. You may create a new worksheet. In symbolic computation, not necessary that you assign a value in every variable, it can solve variable unknowns. Enter below equation in your worksheet. AA and BB are both variable. In here, the equal sigh is not the same to the equal sign we use in step 2. The equal sign here is a Boolean equality that you can get from the toolbox in the header as shown in Figure 21. Another approach is by pressing the keyboard control button then pressing equal button. Once you already formulated the equation, we will solve the value of AA. To do so, put the mouse cursor in the right side of zero same with Figure 22. Then click the icon boxed in red in Figure 23. 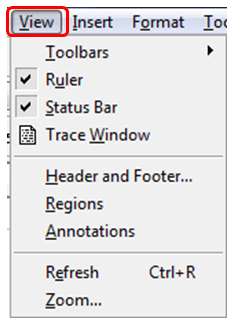 The symbolic toolbar will show up as shown in Figure 24. Then click solve then coma and type AA then left click. The value of AA will be pointed by the arrow as Figure 25. We will stop here and stay tune for the advanced topics.